Great product!! I bought it when I moved into my new house and I love it. It's easy for my kids to use especially when they need to reheat something. I would rebuy if i had to! We purchased this when our old when went out, by far the better brand. It heats quick and evenly! Overall this product is great. I recently moved to a new apartment that did not have a microwave so I was in the market for a cheap but quality microwave. This product has met all my qualifications. I has a lot of different settings which is great for whatever you are trying to heat up or cook. It has a great sleek design as well so it is not as much of an eye sore on my counter (since I do not have a build in spot for it) Overall I am very satisfied with my purchase. Performance Overall this product has worked great. I use it very often and can use it for all different types of food projects I am working on. I really just wanted an affordable machine that would get the job done and this product is it. Settings/Features This product has many different unique features that helps you easily cook or heat up anything you can imagine. 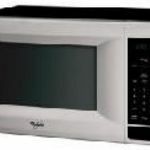 It is very easy to use and I would recommend it to anyone looking for a quality microwave. Ease of Cleaning This product is very easy to clean. Ease of Use Overall this microwave is so easy to use. Because it has so many different features and settings it really helps you cook or heat up any meal easily. Durability I have not had my microwave very long but so far it is going strong. Design I love the sleek design of this product. It is great for me because I have no place for a microwave so it just sits on my counter. 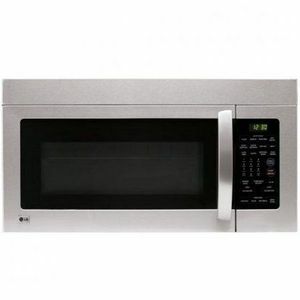 This LG microwave is a great deal for the price. This is the first above range microwave I have bought and it is really nice to free up some counter space, and this has a built-in fan for the range below it. The stainless steel adds some class to the kitchen and ties everything in the kitchen together (all of our other appliances are LG stainless steel as well). Performance This heats food up very quickly and pretty evenly. Settings/Features The EZ on button makes it very convenient to turn it on for a quick 30 second one touch button Ease of Cleaning Because it is an above range microwave, it is a bit tougher to clean, especially if you are on the shorter side. Ease of Use This is very easy to use, lots of preprogrammed buttons to make it quick and easy. Durability I have had it for 2 years and have not had any problems. Design This is a pretty typical design for a microwave. The stainless steel design does make it "pop" in the kitchen. However, stainless steel does show fingerprints much more than other appliances, although with the microwave the fingerprints are not as noticeable as on our refrigerator. I recently bought a house that came furnished with the appliances. The microwave caught my eye because of how stylish it made the stove area look. 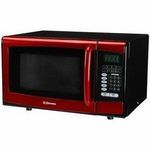 This microwave is a great deal for the price and has lots of convenient features for everyday use. It comes with ten different cooking levels as well as the one touch feature that includes alot of common food settings such as pizza, popcorn or baked potatoes. It also has the auto defrost selection which is great for dinners in a hurry. The microwave also has the popular eco button which helps alot on those electric bills. 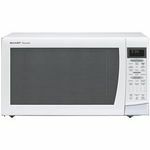 I have looked at the prices of this microwave in many stores and think that it's great value for this product. I definately recommend in purchasing this microwave as i have had great luck with it and have no complaints. The LG can be found at most home improvement stores. You will be more than satisfied with your purchase. So far its a great product! I like this microwave. We bought it about 9 months ago to replace our previously and suddenly broken microwave and it hasn't let me down yet! Performance I like how efficient this microwave is. It cooks more evenly, quickly, and quietly than any microwave I have ever used in the past. I use it several times a day and enjoy its performance very much so. Settings/Features I have never been a fan of the meal specific buttons, such as chicken nuggets or popcorn but I do however, find the defrost options to be very handy and accurate. The fan has two speed and the light has two settings, both of which I appreciate having. Ease of Cleaning the rack inside as well as the turning table are easy enough to remove for cleaning purposes and the inside itself is relatively easy to clean as well. Ease of Use I find this model very easy to use. Durability I have only had this microwave for about nine months but I use it several times per day and so far it has held up perfectly. Design My only complaint is that the rack on the inside seems a little bit lower than it should be and I have to take it out more often than I would like. This is an extremely economical microwave.It was the cheapest new one I could find.It doesn't appear that way though.The design is made to mimic a more expensive microwave.The materials used and finish give a sleek and glossy look and feel.It reflects nicely on my kitchen and matches most other appliances.The wattage is lower than usual though.That's a definite downside.It's usually 1200 watts.It has a venting system I enjoy which helps when I leave food in too long.It doesn't smoke up as bad.You can add time as you go along.That helps when I want to keep the temperature of the food consistent.It has settings for various dishes and foods by simply pressing a button labeled for it.I haven't noticed a difference though.The exhaust system works well.Whenever I leave food in there and it burns it doesn't smoke up as much as my old one.It has an energy saving option which I was also looking for as well. 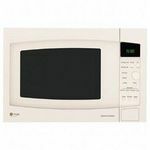 LMV1680ST - A great microwave! We bough the LMV1680ST microwave while we were redoing our kitchen. It's a great product for the price, which is hard to beat these days. So far everything has been working great and we haven't had any complaints. The installation was pretty easy (had some help from the husband), and the microwave came packaged well. 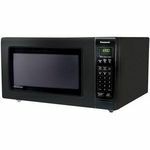 The microwave has simple features (great shortcut keys) and cooks food quickly with controls that are easy to figure out. Another perk is that the microwave can also handle larger items! I love that it is stainless, which matches the rest of our kitchen decor. My only complaint is that the vent/fan seem to be a bit loud, but for the price, it's completely manageable. I've been impressed with GE Appliances I've bought thus far, so we opted for another GE appliance when we were updating our kitchen. We decided to go with the LG 1000 Watt 1.6 Cubic Feet Over - the - Range Microwave Oven because it fit perfectly over our Range and looked great with all the other stainless steel appliances. We have had it about a year and no complaints. It heats evenly (as even as it gets for a microwave), always dependable, has all the bells and whistles for controls. Easy to clean, stains wipe out right away. My only complaint is that the vent fan is extremely loud. Can be annoying when you're trying to watch television or carry on a conversation with someone while using it. Would recommend.